Would you make a good human resources manager? Take our career test to find out how you match with this and over 800 other careers. What is the workplace of a Human Resources Manager like? A human resources manager is someone who oversees and manages a company's human resources department. In some companies the human resources department can be quite large with numerous employees, while other smaller companies may only have one human resources manager to handle all aspects of the department. These managers address the needs and issues of the employees, from hiring and firing, to payroll and dispute management. Depending on the size of the company, the human resources manager could serve a variety of functions. The human resources department generally handles the recruiting, screening, and hiring process for all new employees. This department also helps new employees set up their payroll and explain the benefits available to the new employee. 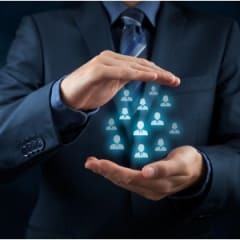 Human resources will also inform current employees of any updates or changes to their payroll or benefits, deal with disputes or harassment claims, develop policies for employee services, handle bonuses and raises, and take care of general employee welfare. Most importantly, a human resources manager must be available to answer the questions and needs of the employees in the company. Employees may come in with any manner of issues and claims, and the manager must handle these complaints with professionalism while respecting and having a firm understanding of the employees and the company's rights. Human resources can never favour one employee over another; they must see that all employees of their company follow the guidelines that have been set out for them. Employee morale is of vital importance to the human resources manager, therefore practices need to be implemented that create and help to foster high employee morale within the company. Managers will often conduct surveys to see which areas of the company can be improved upon, and then they must figure out which suggestions to implement and how. Are you suited to be a human resources manager? Human resources managers have distinct personalities. They tend to be enterprising individuals, which means they’re adventurous, ambitious, assertive, extroverted, energetic, enthusiastic, confident, and optimistic. They are dominant, persuasive, and motivational. Some of them are also social, meaning they’re kind, generous, cooperative, patient, caring, helpful, empathetic, tactful, and friendly. Does this sound like you? Take our free career test to find out if becoming a human resources manager is right for you. Human resources managers typically work in an office setting with a typical nine to five work week. The workload will vary depending on when the fiscal year ends or if there are any major upheavals or changes within the company. A human resources manager will also have to expect a certain amount of interruptions in their day. Employees may come to them with issues that require immediate attention, and the manager will have to address these problems as they arise. The manager may also be called in to update the company executives when policies change.